Marcus Maddison opens the scoring for Posh against Southend. 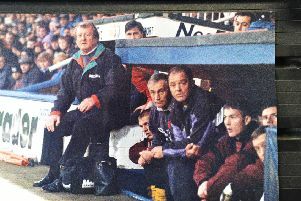 Photo: Joe Dent/theposh.com. Peterborough United star Marcus Maddison believes recently-appointed Darren Ferguson is the manager to bring the best out of him. 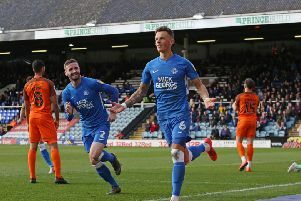 Maddison was man-of-the-match as Posh eased back into a League One play-off place with a comfortable 2-0 home success over Southend United on Saturday (March 23). He opened the scoring with a fantastic free kick before helping to create Ben White’s first goal for the club. Posh players help Marcus Maddison celebrate his spectacular goal against Southend. Photo: Joe Dent/theposh.com. It was enough to earn a third successive man-of-the-match award for the 25 year-old who has been involved in nine of the last 10 Posh goals. He’s scored four goals in his last five appearances to take his tally to the season for seven. “I was pleased to see the gaffer come back,” Maddison admitted. “He brought me to the club in the first place and I love the way he wants to play. It’s certainly bringing the best out of me. “I felt we played well as a front four. We dominated the first-half and although the game got very scrappy after we scored the second goal we won comfortably. “We needed the win. Confidence had been a bit low after losing three games in a week incouding games against the bottom two, but we acted professionally, we looked at what had gone wrong and we put it right. “We showed we are still fighting and we put on a show for a big crowd. “We had started pretty well in our last home game, but couldn’t score and I thought ‘here we go again’ when we missed a few chances early in this game. “But I struck the free kick well for my goal after the goalkeeper had given me far too much to aim at and the second one bounced awkwardly in front of him for the second goal. “I’ve scored two free kick goals recently now and the last time I scored from one was probably under the same gaffer in his previous spell. Maybe he’s the one providing the magic. Posh don’t play again until hosting Gillingam on April 6. Posh will drop out of the play-off places if Doncaster pick up a point from a home game with Bristol Rovers tomorrow (March 26).